High quality adult cat food providing complete nutrition for your feline companion. Delicately sliced pieces served in a tender gravy. An ideal serving for fresh-tasting cat food every mealtime. 50g cat food pouch gently prepared, with a delicious flavour that cat's love. Delicious pet food made from select ingredients and certified sustainable fish. 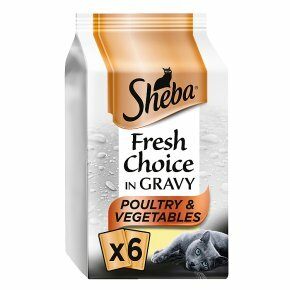 Quality cat food recipes made with no artificial colours or preservatives.Delicately sliced pieces, served in a tender gravy. Perfect servings for fresh-tasting cat food every mealtime. A wonderful way to keep your feline friend interested, time after time. Available in 50g cat food pouches.